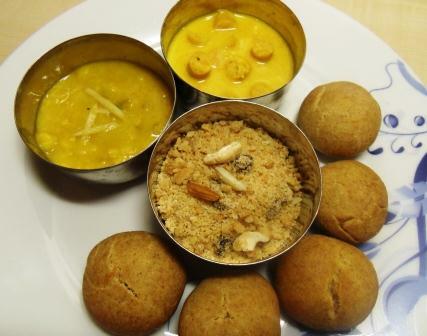 Daal baati is a traditional dish from Rajasthan. It is supposed to be difficult to make and only expert cooks usually take courage to prepare it. Let me tell you a little secret. It is in fact an extremely easy dish and has just been hyped up because it used a lot…and I mean a lot of butter/ghee. However, you can easily tone it down to a healthier version and kick it up a notch if you are entertaining guests. Soak all the daal together for 1/2 an hour in water. Boil them in a pressure cooker and keep aside. Heat the butter in a large saucepan. Add asafetida, cumin seeds, bay leaf, dried chillies, clove, cardamom and cinnamon. Saute for 2 mins. Add the ginger garlic paste and saute for 1 min. Add the boiled daal and 2 cups of water and the rest of the ingredients. Bring to a boil and let simmer for 5 mins. Heat the oil till it is lukewarm. Mix with the dry ingredients to get a crumbly mixture. Take about 1 cup lukewarm water and slowly add it to the flour mixture to knead a firm dough. Divide the dough into 12 pieces and roll into smooth balls. Flatten them a little. Bake in the oven for 20 mins. Turn them over and bake again for 15 mins. Rub the baati all over with a butter stick or use a pastry brush instead. This will keep the baati soft and is the healthier version. But if you are going the traditional way, soak them in loads of warm ghee. Serve them hot with daal. The Louvre Museum has 8.5 million visitors per year. This blog was viewed about 89,000 times in 2010. If it were an exhibit at The Louvre Museum, it would take 4 days for that many people to see it. In 2010, there were 25 new posts, growing the total archive of this blog to 147 posts. There were 46 pictures uploaded, taking up a total of 3mb. That’s about 4 pictures per month. The busiest day of the year was August 6th with 3 views. 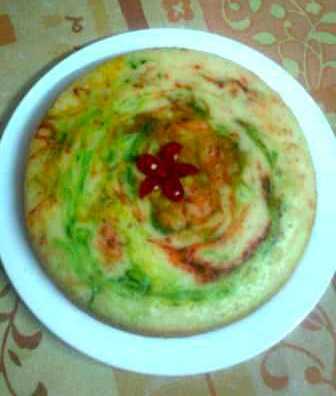 The most popular post that day was My First Eggless Cake – Baked in Cooker. The top referring sites in 2010 were alphainventions.com, foodbuzz.com, google.co.in, webcache.googleusercontent.com, and en.wordpress.com. Some visitors came searching, mostly for cabbage sabzi, sabudana, how to make eggless cake in pressure cooker, sabudana khichdi, and eggless cake in pressure cooker.